The education and community work, throughout the year, can cover anything from working in pre schools for children of three years old up to Sixth form and above. Greek music is a wonderful way of learning about different rhythms, sounds of the world and the skills needed to work in a group with other people. It is a great way of learning creative skills through listening, improvisation and dance. It is important to stress that we do not only work with Greek schools. In fact, most of the education work has been in British schools and communities. Sometimes the education and community work come together. The most recent project we worked on was a one day workshop which brought together thirty young instrumentalists with a choir of sixty people aged from six to eighty years old. 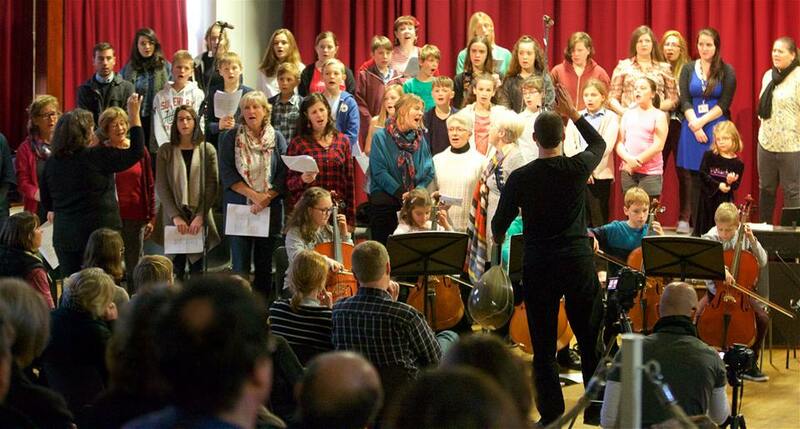 It involved children from different schools as well as a local community choir. After a full day of workshops, learning songs, looking at improvisation and creating their own arrangements of music, in the evening they were joined by a ten piece band of professional Greek musicians to perform in a concert together. We work closely with several schools and groups including Oathall Community College, St Joseph’s pre school in Haywards Heath and Kite music.